Two zebras escaped from a circus in West Philadelphia on Sunday, leading police on a wild chase for miles through the city. The zebras, according to witness accounts, somehow got loose from the UniverSoul Circus outside the Mann Center for the Performing Arts, near 52nd Street and Parkside Avenue in Fairmount Park and ran out of the front gate. Police Radio confirmed about 2 p.m. that zebras were loose in West Philadelphia and officers were trying to catch them. "All I saw were two cops chasing the zebra, "said Rashad Smith, a witness. "We thought it was a horse." 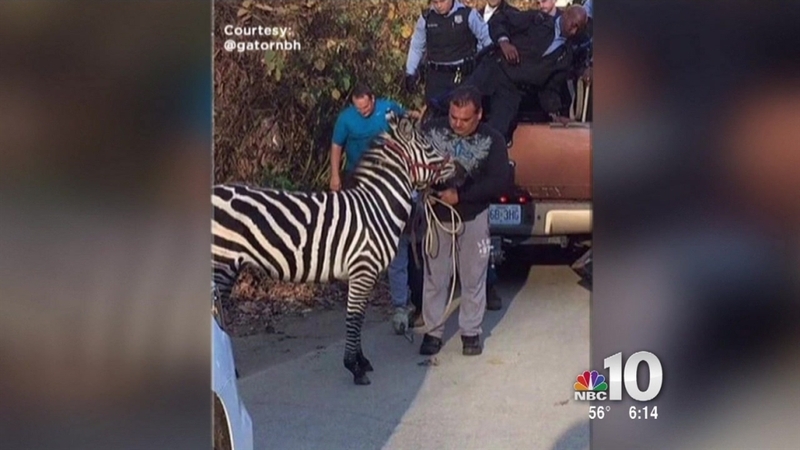 Police sources said about 2:20 p.m. that one zebra had been caught and the second remained on the lam. The fleeing zebra, according to sources, made it up to City Avenue — more than two miles from where the animals escaped. By about 2:40 p.m., the second fleeing zebra had been successfully caught, although the location where police finally stopped the zebra was not immediately clear. There were no reports of any injuries to the animals or to any people, and it was unclear how the zebras escaped. Two zebras briefly went on the loose from the UniverSoul Circus site today in Philadelphia, both have been safely corralled with no injuries. An investigation is currently underway. The runaway zebras caused a frenzy on social media as witnesses posted videos, pictures and jokes about the animals. Even Philadelphia Police posted a lighthearted tweet after the animals were captured. It was no laughing matter to animal rights activists however, who have been protesting the UniverSoul Circus, demanding that they stop using animal acts for entertainment. "Oh it's not funny at all," said Marianne Bessey of the Animal ACTivists of Philly. "It's a really horrific experience for the zebras who probably saw a chance to escape and thought they were gonna maybe get some outside time instead of being inside a small pen. And instead they end up in traffic running and terrified." Yet again, animals have escaped a circus and been chased through a city they never should have been taken to in the first place. UniverSoul needs to retire its animal acts immediately, and all kind families should refuse to buy a ticket to any circus that exploits animals. PETA is asking the U.S. Department of Agriculture to investigate immediately to ensure that the animals are receiving veterinary care and have safe and proper enclosures. Sunday was the UniverSoul Circus' last night in Philadelphia. Aside from the zebra incident the circus also made headlines in late October, after a trapeze artist fell three stories when his high-flying stunt went awry. He suffered a lower back injury but was eventually released from the hospital.